The double-faced features of bling-bling. 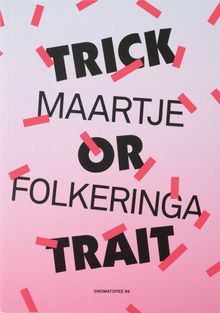 This is the first monograph on the art of Maartje Folkeringa (1978), a mid-career, upcoming Dutch artist, whose sculptural work sets out for the non-verbal forms of tactile communication in our behavior and social interaction. Through the choice for specific materials and the way they are processed into totems of status, this physical body of work humanizes the popular and high-end finery with which we rank ourselves and others through the lens of art. It plays with the totems by which we (un)consciously postulate our social hierarchy, allowing both the positioning of the art-object and the signaling of our status. This book is a must-have for those who wonder what they must have. Both suggested and framed as a cut-and-paste sourcebook full of inspiration and proposals towards artistic endeavor, this book is designed with colorful respect for grandeur and subversive exclusivity, featuring enthusiastic lively texts that explore qualities in life and sculpture simultaneously. Paperback, 6.7 x 9.5 in. / 96 pgs / 42 color / 18 duotone.